No one knows Australian termite protection and control like Skip! If there is one thing Skippy does best, it’s controlling those nasty pests – termites! We have extensive history in providing termite inspections, treatment, control and protection to hundreds of satisfied clients all over South East Queensland. You could have termites! Call Skippy today on 07 3803 0698 to arrange a consultation or fill out our contact form and one of our helpful and friendly staff will contact you. Did you know that termites are responsible for more economic loss each year than all natural disasters combined!?! Statistics show that 1 in 4 Australian homes experience termite problems. 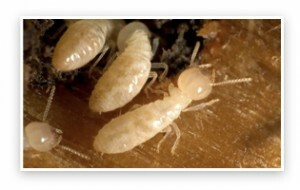 Wood-eating termites, particularly subterranean termites, are recognised as being of significant concern to home owners in Australia, where it is recorded that more than 350 species of termites exist. Of these, around 25 species achieve economic importance as pests of timber. Don’t become another statistic of termite turmoil, contact Skippy today and ensure your greatest asset’s safety with our termite inspections, treatment, control and protection. Termites prefer damp, dark habitats and set up nests underground and in the trunks of trees. From this command centre they launch attacks on structures by tunnelling for a considerable distance through the soil and building mud shelter tubes up the side of the structure. Termites don’t just attack timber houses – this is a popular misconception. While non-timber houses have a lower risk of major structural damage, all types of houses are at equal risk. 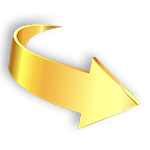 Timber is just one source of food that termites hunt. They also damage plasterboard, carpets, plastics, books, artwork, clothes, insulation and fit-out timbers. The risk and feeding habits of termites varies accordingly to your location in Australia. As a general rule of thumb, the scale of probable risk gets higher the further north you are located, peaking at extreme in the top end. Some species are more aggressive than others, with those in the far north earning a worldwide reputation for being particularly ferocious feeders. Older and larger colonies typically have a greater impact than newly established colonies. 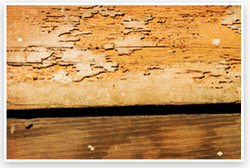 Protect your home today from termites with Skippy’s termite control and protection services. Phone 07 3803 0698 to arrange a consultation with one of our professional pest inspectors.